The Chan Chan Archaeological Zone covers the former capital of the Chimú Empire, the largest city of pre-Columbian America and a masterpiece of town planning. The remains consist of nine rectangular ensembles, the “Palaces”. A palace was a personal domain of a Chimú chieftain and an independent unit with its own temples, dwellings, reservoirs and gardens. There were also four industrial sectors, for woodwork, weaving, and the work of gold and silver. It is estimated that 30,000-60,000 people lived here in a zone of ca. 20 square km’s. The Chimu Empire stretched along the northern coast from Lima to Ecuador. The Chimu replaced the Moche here around 1200. It reached its zenith in the 15th century, just before it was weakend by the Inca and the Spanish. It was a fertile area at the time due to the use of irrigation via a vast network of canals diverting water from the Moche river. The site was first excavated in the 1960's. Large parts are still uncovered, and suffer from erosion on the vulnerable adobe. The walls are decorated with raised friezes, displaying abstract motifs and anthropomorgical and zoomorphical subjects. 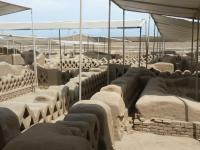 Chan Chan is very vast site located in the Peruvian coastal desert. Its setting reminded me of Ancient Merv in Turkmenistan – a desolate location under the radiant sun, where you really don’t want to walk. The only part open to visitors is the Palacio Nik An, one of 9 similar units at the site. It does see more visitors than I had expected: 90,000 in 2009, mostly Peruvians from Lima (and 760 fellow Dutchmen). I visited on a Saturday and there were many tour groups around. What you will see there is a lot of sand and adobe. Walking around the palace is like walking through a maze of plazas and walled compounds. Its best features are the clay friezes that adorn the walls. Most of them have marine scenes – depicting the sea, fish, pelicans, fish nets, sea lions. The “authenticity” of this site is somewhat dubious - ICOMOS called the restoration of the palace a "highly criticized pastiche". The urban lay-out is original of course, but most of the friezes are replicas. They are a bit too perfect and complete to be convincing. For better and more original friezes you really have to visit the nearby Huaca de La Luna, a brilliant Moche-site that should be a WHS but isn’t even on Peru’s T-list. I visited Chan Chan on a tour from Trujillo. However, I would recommend going there by yourself (taxi or bus), so you will have enough time to see the site properly. You can hire a guide at the entrance. My tour was very chaotic, after having rushed through neighbouring sites we actually arrived too late at Chan Chan’s entrance (after 4.30 p.m.). The group before us were the last ones allowed in. Of course I was determined to get in anyhow, and I attached myself quickly to that other group. After some arguing “my” group was let in too and I reconnected with them. The guide was good at least (only in Spanish). It was a bit surprising to find out that the main road from Trujillo Airport to the city center is cut through one of the Peruvian most interesting archaeological sites and a World Heritage Site of Chan Chan, so during my three days visit to Trujiilo, I had a chance to see the view of countless eroding mud ruins of Chan Chan at least five times. I decided to make a proper visit in the Afternoon as recommended by a hotel concierge for less tourists and better light. Before I visited Chan Chan, a taxi driver took me to see two beautiful small Chimu temples, Huaca del Dragon or Arco Iris and Huaca Esmeralda. I really impressed the figures craved on the adobe wall of Huaca del Dragon, which in my opinion more impressive than Chan Chan. Then I proceeded to Chan Chan. The size of Chan Chan is really amazing even though the only thing I saw is the ruins of high wall which are eroding and waiting for the restoration. Only small area of this vast area has been restored and called Palacio Nik An. When I arrived the palace, I found the whole complex was under some kind of construction. The authority was building the large bamboo shelter as they predicted that from El Nino phenomenon, there will be numerous rainfall for couple of years, so in order to protect all adobe buildings from rain erosion, the whole complex need a protective roof. 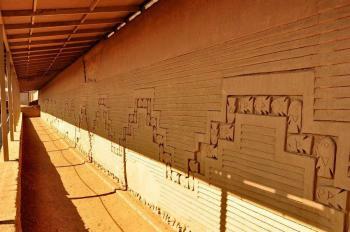 The most impressive thing of Chan Chan is its motif that decorated on the wall throughout the complex. The motif is related to ocean and sky. My guide explained to me that the whole palace I saw are mostly a reconstruction and the original ones are covered by the plastic copy. He even asked me to touch the surface and I was a bit shock that it was indeed a plastic! However in my opinion I am OK for this kind of restoration as it is still better to let the real one to be eroded by time. My guide also showed me the tomb of king and sacred pond which are really interesting. Chimu Culture is really unique in my opinion, the way they built the new palace and sealed the old one after the king’s pass away reminded me the similar practice of ancient Japanese that moved capital every times the new emperor reigned. When I discussed this matter with the guide, he surprised and told me that recent study of ancient pottery found that some Chimu potteries have many similarities with ancient Japanese potteries and there is a legend that the Chimu people came from the different side of Pacific! Anyway Chan Chan complex is really a great place to visit and explored other civilization other than the famous Inca, and another great World Heritage Site in fascinating country of Peru. Chan Chan was a site we had long wanted to visit but, when it came, the “reality” didn’t, for a number of reasons, quite live up to the “vision”! One’s image of unvisited places is often built up in subliminal ways and mine I guess came largely from a 1972 book “Monuments of Civilisation – The Andes” whose photos showed a “remote” ruin devoid of modernity, stretching as far as the eye could see. The reality today is a complex of posts and protective roofs(Photo)with smooth “replastered” walls/decorations and entrance limited to just one part – the so called Tschudi Palace (or “Nik-An”) which is just 1 of 10 such “palaces” thought to be 1 for each Chimu king (and there are vast areas beyond the main compounds of workshops, lesser housing and other monuments). The site also perhaps suffered in comparison with Huaca de la Luna which we had seen in the morning. The lively polychrome frescos there made the artwork at Chan Chan which consists of moulded and stylised creatures/shapes in grey mud look very dull! Back home, however, the site’s significance and value seems somewhat greater. Despite the downsides, it is one of the world’s great archaeological sites and a visit should be undertaken by anyone interested in archaeology. The site suffers just about every preservation problem one could imagine – erosion by wind and rain, ground water ingress, looting, squatting, farming, road building, rubbish dumping etc. As we approached by the main road we could see the undoubted signs of archaeological remains on every side but the “integrity” looked very weak. I hadn’t appreciated that we would only be allowed into just 1 compound – but that was pretty big by itself and took almost 2 hours to go round so I guess one can understand why the Peruvian authorities limit the areas which are open so as to reduce security etc problems. It appears that digging continues in some of the other areas – in 2006 for instance 18 carved wooden warriers were discovered in the Velarde Palace. The lay-outs of the various compounds (sometimes referred to as “Citadels” rather than “Palaces”) are very similar – Each consists of a tall walled (originally and, where restored, up to 9 metres high) enclosure containing a standard range of structures albeit with the location and numbers varying, but generally oriented in the same way North to South – Plazas, smaller courtyards, U shaped rooms called “Audencias” thought to be for administration, storerooms, wells of various sizes and significance, living quarters for the elite and finally (sometimes) a burial platform. All sections are connected by long corridors reaching through doors to what were presumably more and more restricted areas. The walls and some rooms are decorated with friezes of stylised patterns or creatures which vary as between Palaces. As an indication of size - Tschudi for instance contains 2 Plazas, 17 audencias, 242 storerooms and covers 10ha. It really does help to understand the basic layout of both the individual palaces and of their relationship to each other and to have some idea of the possible functions of all of this (much of which is hypothetical!) before you visit, otherwise the trip through is just a maze of corridors and rooms – I tried but wish I had done more!! Tschudi of course has undergone the major reconstruction which has been so criticized but which also, no doubt makes the complex more comprehensible. I would suggest that a good guide is worth having – but ours, who came with our minibus tour, unfortunately didn’t have an easily comprehensible English accent and was rather formulaic in delivery. There are quite good bilingual signs and models within the complex which help. I also hadn’t fully appreciated before hand the relative lateness of the site – it commenced around 850 AD (although expansion and the main construction didn’t commence until around 1100) and the Chimu were conquered by the Incas as late as 1475, only some 60 years before they in turn were conquered by Pizarro. It should be noted that, in 2006, the Peruvian authorities decided to start using words from the Mochica language to name the various Palaces. 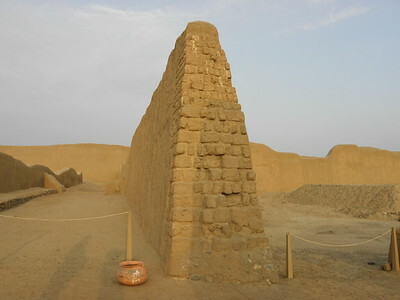 All the palaces were originally named after archaeologists or others who had some connection with Peruvian archaeology. For those who are interested I append to this review a list of the 10 palaces together with the names of those they were named after, together with the new ones with their meanings. They were quite difficult to track down but each has a Wiki entry if you use their full details! Some sources state that there are only 9 palaces with Telle regarded as just an annex. And there are also debates about their sequence of building, use of the rooms, why some have funeral platforms and a few don't etc etc. All in all there are a lot of interesting issues to follow up both before and after a visit! 1. Tschudi/Nik An/House of the Center. Johan Jakob von Tschudi. (1818 - 89). Swiss naturalist, explorer and diplomat. 3. Bandelier/Nain An/House of Sea Birds. Adolphe F Bandalier (1840 – 1914). American Archaeologist. Born Berne Switzerland. 5. Squier/Fochic An/House of the North . Ephraim George Squier (1821 – 88). American Archaeologist and newspaper editor. 6. Tello – Tsuts An – Small house . Julio C Tello – (1880-1947). Peruvian. “Father of Peruvian Archaeology” First indigenous archaeologist in the Americas? Another magnificent Peruvian WHS! And I get to review it first! Hurray! Childish crowing on my part aside, this is another excellent place to visit. The entry fees are cheap and good value as well. Chan Chan is an amazing place, and is absolutely enormous. I believe that at one time it was the biggest city on the planet, but that would need to be checked. To be honest, much of the site is in complete ruins and is nothing more than large piles of mud. However, the Tschudi Palace is being constantly restored and gives a wonderful idea of how magnificent this city must have been. I'm no expert but the restoration work seems to be going along sensitively and successfully, and this is one site where it is a case of restore it as much as possible, or lose it completely. The El Nino effect has clearly caused a massive amount of damage to the site (and it finished off Chan Chan as a living city). I do not know why it is on the 'in danger' list but I guess it is for two reasons. One is El Nino - this is a situation that will never change. The second is probably the vast amounts of refuse that seem to be piling up around the outside of the city itself. This is something that seriously needs to be addressed. Visitors to Chan Chan should also check out the nearby Huaco De La Sol and Huaco De La Luna. An incredible site that definately should be on the WH list, and created more of an impact than Chan Chan. Places of Execution: Chan Chan Massacre (1932): hundreds of protesters were lined up and shot in Chan Chan, after the failure of a revolt against Sanchez Cerro, the dictator who was trying to wipe out the APRA (American Popular Revolutionary Alliance, a socialist and reformist party) and its supporters . Max Uhle: One of the 10 "palaces" at Chan Chan was named in honour of him - Uhle (Also titled -"Xllangchic An" (In Mochica) and "House of the East").